The Royal Concertgebouw Orchestra offers here an ideal programme of three great modernist works premiered in Paris between 1894 and 1913. The composers were friends, each piece had a long gestation and was painstakingly crafted by artists who were consciously doing something new. Pierre Boulez saw Prélude à l'après-midi d'un faune as the first modern piece, asserting “the flute of the faun brought new breath to the art of music”. But how do you revolutionise late 19th century orchestral music, with its bloated Strauss and Mahler orchestra? Debussy’s way is to lower the voice, soften the tone, blur the colours – and go back to Schubert’s orchestra, or nearly. OK, we are in France so we need a couple of harps, plus a pair of antique cymbals. Of course on DVD we can see all this, and this programme has a lot of such visual appeal, especially when we get to Stravinsky’s huge forces. Prélude à l'après-midi d'un faune has a subtle shape-shifting form to match its sensuous emotional world. Illustrating the dreams of a faun on a hot afternoon requires pastel shades, subtle dynamics and a feeling for rhythm in which the bar lines melt away. Debussy’s score provides the instructions to the players, but this work in particular leaves players and conductor much to do if it is to cast its spell. From the outstanding opening solo from the RCO’s terrific Principal Flute (she is unnamed alas) through to the score’s exquisitely languorous leave-taking, this is a beautiful and beguiling performance. Gatti has the measure of the Prélude’s ebb and flow, gives his excellent players room to play, and is rewarded with several fine solos from the horn and woodwinds. The marking at Fig.5 is “Toujours en animant” and that growing liveliness is well judged by Gatti. Perhaps there could have been more passionate urgency at the climax, when the spirit of Eros enters in the form of the soaring violins over ecstatic duplets from the woodwinds. But Gatti’s relative restraint, and his overriding concern for beauty of texture, work well in this elusive piece. La Mer uses a big orchestra and so now we see the platform fill up. The work’s subtitle is “Three symphonic sketches for orchestra”. Interpreters generally latch either onto the term ‘sketches’ – and so emphasise the impressionism – or on ‘symphonic’, so focusing on the structure with its cyclic elements. But these are not mutually exclusive and conductors can do justice to both, so that we were taken on a satisfying symphonic journey, but can enjoy the views painted for us along the way. This seems to be Gatti’s way with the piece. The passage for divided cellos in the first movement is warm in tone and eloquent in expression. That movement is titled ‘From dawn to midday on the sea’ and the RCO brass greets the noonday sun with a noble blaze. They do so again at the final climax of the ‘Dialogue of the wind and the sea’ which is truly “animated and tumultuous” as marked. With Le Sacre du Printemps quite a few more players are added but still the spacious Concertgebouw platform – and its spacious acoustic – can easily accommodate them. Gatti takes a fairly traditional approach to tempi in the score, but that does not imply complacency – he is rhythmically very alert. The famous opening bassoon solo, along with its clarinet and horn counterpoint, is up to the high standards from these sections heard all through the evening. The ‘Dance of the Adolescents’ is fast and balletic and the players shape its solo moments convincingly. The solo horn at Fig. 25 is really excellent, observing the mezzopiano and subsequent piano markings. Le Sacre should often sing as well as dance, as it does here. Gatti does not, as say Teodor Currentzis did in his 2015 CD, overdo the primeval blood sport aspects of the more violent passages such as the ‘Dance of the Earth’ that closes the first part. The eerie Largo introduction to Part Two, the most Debussian passage in the score, is poetically atmospheric, and indeed this second part is very compelling right up to the final ‘Sacrificial Dance’. There are no extras on the DVD, and its programme does not have any direct competitors as far as I am aware. The DVD’s wide-ranging sound is excellent, capturing well the celebrated acoustic of the Concertgebouw, so too are the picture and camera work – there are occasional views of the famous hall, which is an evocative space. Above all Gatti is a sure guide through these demanding works – he uses no score for any of them – and the orchestra plays immaculately throughout. Many orchestral concert DVDs are at least an enjoyable souvenir of a live occasion. 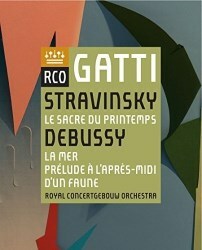 But this RCO Live issue has three performances good enough to take it into another league.